After posting all of my thoughts on prusak.com for almost 6 years, I’ve finally created a dedicated blog just for my professional postings about web analytics, split testing, optimization, digital marketing, etc. I’ll still post my non-work related stuff here, but if you’re looking for a conversion optimization expert stuff, please check out my other site. Have you ever used the map overlay report in Google Analytics? It’s a fairly straight forward report that provides site metrics broken down by geographic region. When viewing data for the United States, you get a row of data for each state. Most of the metrics provide useful information if the visitor’s state has any significance to your business. For example, visitors from Ohio might have a significantly lower conversion rate than other states, prompting you to adjust you online campaigns accordingly. There is one metric though that’s alway’s annoyed me. The Visits metric simply tells you the number of visits to your site, and in our case, the number of visits from a specific state. The problem is that in it’s raw form, this number doesn’t really provide any value. Guess what? These states are the states with the largest population. 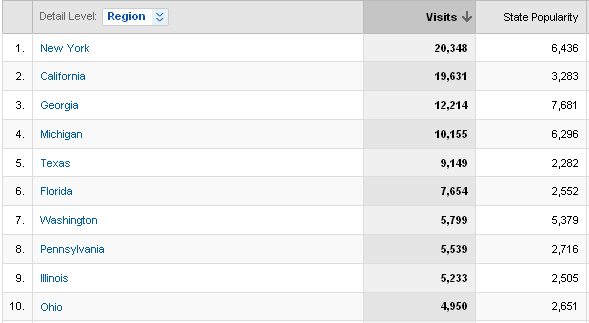 What I really want to see is how popular a site is per state, factoring in the actual state population. Lets call this metric State Popularity. In the past I simply downloaded the visits per state data into an excel spreadsheet and divided the number of visits by the state population. Crude, but it works. I was discussing this with Jeremy Aube who wrote the fantastic Google Analytics Report Enhancer (or G.A.R.E) plugin for FireFox. I asked him if he could add State Popularity functionality to GARE and a few days later he did it! The stats above are for a site that provides reviews and cheats for video games. Looking at California (#2) and Washington (#7) it becomes obvious that although the site has almost three times more visitors from California than from Washington, I would guess that Washington has more gamers per-capita than California. Jeremy should have more details about the technical side of things on his blog shortly. Enjoy and big thanks to Jeremy! I’ve recently come across two new split testing services that are trying to bring split testing to the masses. While I love GWO, the underlying assumption is that you can create the HTML for your tests on your own. For many of the smaller mom-and-pop sites, simply creating the test pages or sections is beyond their capabilities. Both of these new products come with a built in WYSIWYG editor, which truly lowers the barrier of entry for split testing. Both products look promising and you should try them out. One thing I really liked about Visual Web Optimizer is that it will grab your current page and then let you create variations based on your existing page. Both products are in private beta but I got a hold of some invite codes. Don’t forget to use PRUSAK as the sneak peek code when signing up for Unbounce. I was reading a simple case study today. They were testing two different versions of a banner that was advertising a webinar. One of the banners had an image of the presenter, while the other did not. The banner without the image of the presenter won (by over 50%). I guess this audience prefers banners without an image of a person. If you don’t immediately realize the mistake the commenter made, don’t feel bad. It’s a very common mistake. Beyond the fact that a specific banner (which did have have an image of the presenter) won over a different specific banner (which did not have an image of the presenter) you really can’t be sure of anything. The same image of the same person in a different position or size on the banner. The same image of the same person in the same position and size but with different elements on the banner changed. Don’t jump to generalized conclusions based on the outcome of a specific experiment. I just found this post from a couple of months ago that has a plethora of great examples of call to action buttons. Changing the call to action button is one of easiest ways to improve your conversion rate. Google Analytics just officially announced a boatload of new features. I’ve known about the new features for a while (under NDA) and have been thinking about how to best take advantage of them. More to follow in future posts. Jeremy Aube from ROI Revolution just posted an awesome solution for not needing to update your conversion page tags on your GWO conversion pages. Out of the box, MVT experiments with GWO will serve up all possible permutations for an experiment. Sometimes you want to create sections that are related to each other. For example – a header and footer section that need to be coordinated with each other. The red header needs to be displayed with the red footer and the blue header needs to be displayed with the blue footer. There is a very simple solution to this. Just create the experiment as usual and right after you launch the experiment use GWO’s pruning function to remove the combinations you don’t want to serve up (i.e. the red header with the blue footer and the blue header with the red footer). Every now and then I find a good case study. This posting serves as a simple list of those I want to keep for further reference. I’ll be adding posts as I find them. A few years ago I decided to get a “video jukebox” type of device that would let me view videos (mostly my daughter’s stuff) without having to switch DVDs all the time. At the time I got an Archos TV+. It’s a great device, but is no longer supported and doesn’t support HD. I’m creating a list and will post here later, though please chime in if you have suggestions.